We think you'll love our townehome. 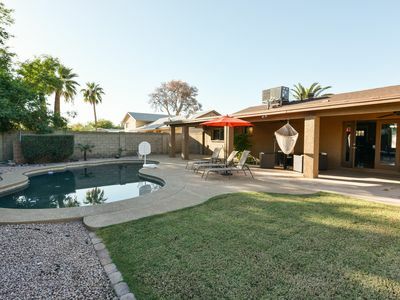 It is a private home with lots of character located on the end of a quiet residential street in central Tempe. The property is managed by the owner. Please feel free to inquired if you have any questions or need any further information. 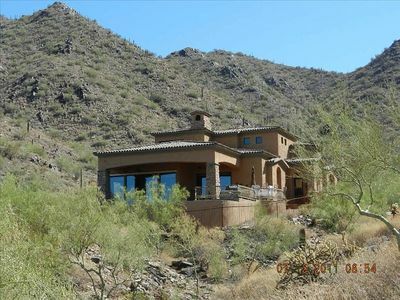 The house has over 1800 square feet with a large garage and wide driveway with room for 2 cars. 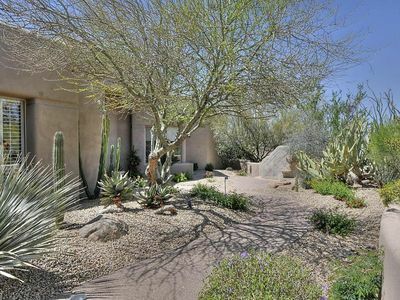 It features your own private fenced in pool (it is not heated) and beautifully landscaped yard that borders the Shalimar 9 hole golf course. The house is uniquely decorated in southwest decor. 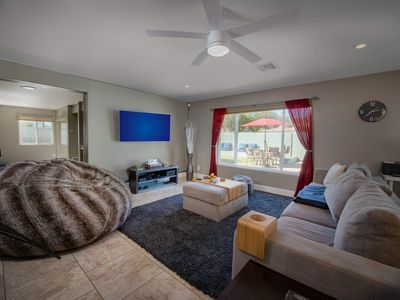 Enjoy relaxing in the 6 seat Dimensions I hot tub that is located on the patio outside the master bedroom. 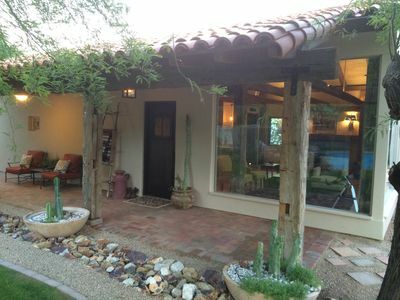 The backyard is enclosed for privacy and is landscaped with separate grass lawns, citrus trees, rose and flowering bushes. It attracts a variety of birds and hummingbirds. 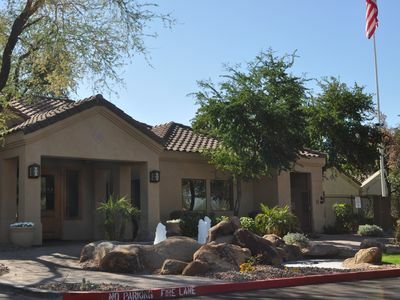 Sit out on the furnished patio (repaved this summer) and enjoy coffee and listen to the birds in the morning, or grill steaks and sip drinks in the evening while watching the sunset and enjoying the golf course views. 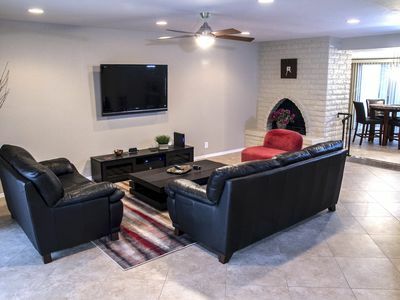 The house features two unique large living rooms that are separated with stone pillars, and is well furnished with rich leather furniture, a down chaise and a 60' Sony HD tv, and blue ray with the Direct TV extra package for watching your favorite game or movie. The kitchen is well stocked and equipped and the house has internet and wi-fi. The master bedroom opens out to the backyard and to the hot tub next to the rose and flower garden. It features 2 twin beds with Simmons Beautyrest Kirkwood euro pillow top plush mattresses, and a 40' tv. The 2 beds are pushed together and converted into a king size bed with the connector. They can be separated into single beds if desired. The master bathroom was recently remodeled. The second bedroom features knotty pine built in woodwork with southwest decor, and a queen size murphy bed and large attached bathroom. The bathroom was recently remodeled with new cabinet, counter top, mirrors, lights and twin sinks. Both bathrooms feature multiple grab bars in the showers and tubs. The bedrooms are separated by a long hallway which provide privacy from each other. Great for separate couples, a group of guys or gals, or a family. 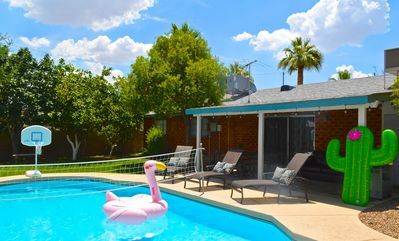 There is a large patio in the back that has access through sliding glass doors, a grill and unheated pool with deck and chairs, and there is also a washer and dryer. We also have 4 bicycles for your use to enjoy the neighborhood. 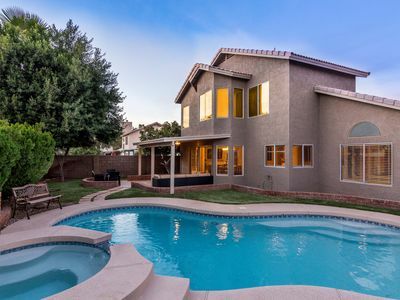 The house is a wonderful retreat for enjoying the sunshine and taking it easy, reading a good book, watching tv, or just relaxing on the patio or going for a swim. 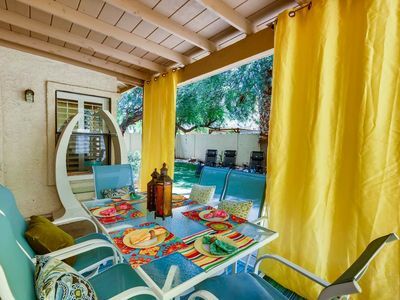 It is great for entertaining family and friends with the large dining room and patio area and backyard. 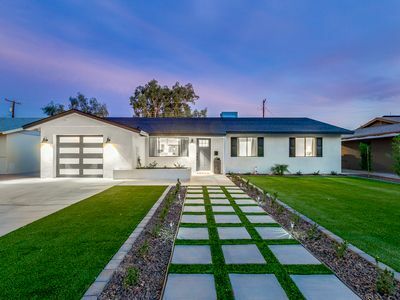 It features a new patio that was installed this year. 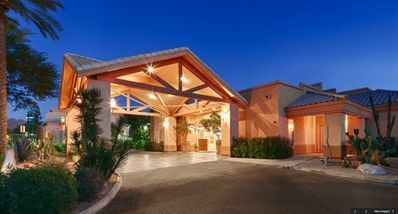 There are sleeping accomodations for 6 with an additional self inflated quality queen size mattress that can be put down in one of the large rooms. 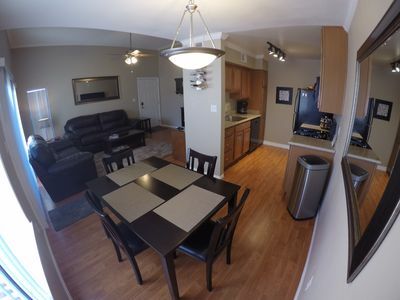 There is a table in the kitchen that seats 4 and a separate dining room and table that sits 8, and expands for additional seating, plus a cocktail table and chairs in the second living room. 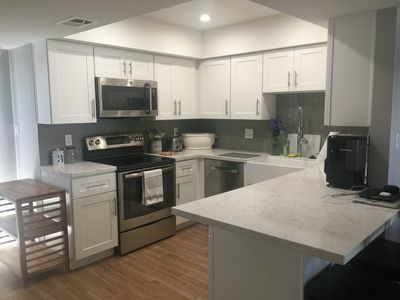 There is table service for 12 with additional silverware and wine glasses, coffee maker, blender, mixer, juicer, crock pot, all kitchen utensils, etc. It is a great house for entertaining. There are plenty of towels and extra sheets. Numerous grocery stores, restaurants, banks and churches within 3 miles, and it is within 10 mins. 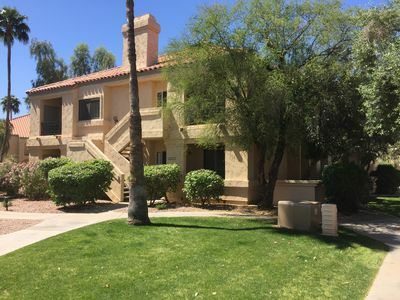 to additional golf courses, the Talking Stick casino and resort, Papago Park, Phoenix Zoo, Botanical gardens, spring training fields, and is also very close to the Tempe Marketplace, Mill Avenue and ASU, and the Tempe town lake. Its close access to H-101, H-202 and H-60 makes it easy to get to anywhere in the valley without having to deal with stop and go traffic. 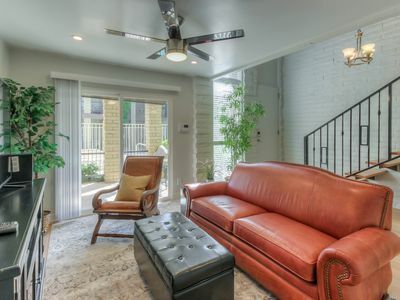 It is located in an attractive quiet neighborhood that is great for taking walks and bike rides with little traffic. We enjoy its central location which allows you to get around without spending the day driving, unless you want to. Great Location! 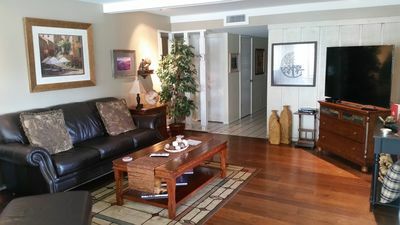 2BR/2BA Condo In Old Town Scottsdale! Great Location. 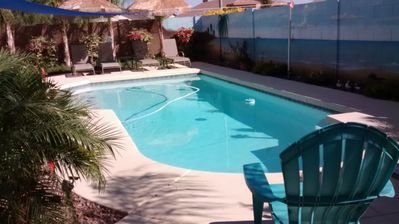 3BR/2Bath Gated Community. Amenities And More! 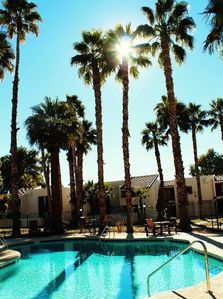 Premier Resort Gated Community - Tennis - Pools - Close to Everything! 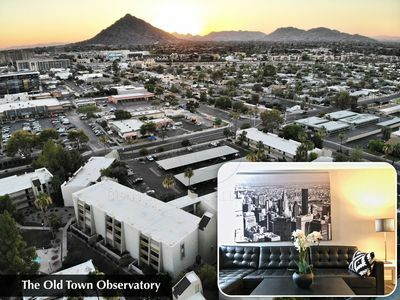 *The Old Town Observatory*—Renovated—Penthouse—#1 Location—2/2—VIEWS! 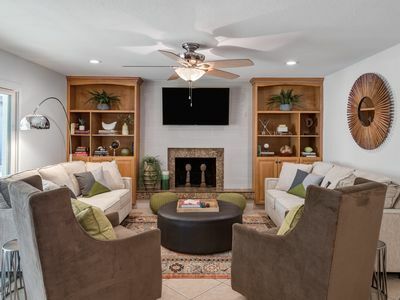 Completely Remodeled In Oct. Of 2017 - Old Town Scottsdale Property!!!!! !